Dr. 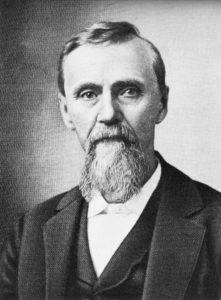 Still was born in Virginia in 1828, the son of a Methodist minister and physician. At an early age he decided to follow in his father’s footsteps and become a physician. After studying medicine and serving an apprenticeship under his father, Still became a licensed MD in the state of Missouri. In the early 1860s, he completed additional coursework at the College of Physicians and Surgeons in Kansas City, MO and went on to serve as a surgeon in the Union Army during the Civil War. After the Civil War and following the death of three of his children from spinal meningitis in 1864, Dr. Still concluded that the orthodox medical practices of his day were frequently ineffective, and sometimes harmful. He devoted the next ten years of his life to studying the human body and finding better ways to treat disease. His research and clinical observations led him to believe that the musculoskeletal system played a vital role in health and disease. He concluded that the body contained all of the elements needed to maintain health, if properly stimulated. Dr. Still believed that by correcting problems in the body’s structure, through the use of manual techniques now known as osteopathic manipulative medicine (OMM), the body’s ability to function and to heal itself could be greatly improved. He also promoted the idea of preventive medicine and endorsed the philosophy that physicians should focus on treating the whole patient, rather than just the disease. These beliefs formed the basis of a new medical approach, osteopathic medicine. Using this philosophy, Dr. Still opened the first school of osteopathic medicine in Kirksville, MO in 1892. Physicians licensed as Doctors of Osteopathic Medicine (DOs), like their MD counterparts, must pass a stringent national or state medical board examination in order to practice medicine. Osteopathic physicians use all of the tools available through modern medicine including prescription medicine and surgery. They also may use OMM techniques to diagnose illness and injury, relieve pain, restore range of motion, and enhance the body’s capacity to heal. Reflective of the osteopathic philosophy of treating the whole person, many DOs serve in the primary care fields: family medicine, general internal medicine, and pediatrics. There is also a long tradition of osteopathic physicians establishing practices in rural and medically underserved areas. Today DOs provide comprehensive medical care to patients in all 50 states and the District of Columbia, and have unlimited practice rights in more than 65 countries. Currently, there are more than 74,000 DOs practicing in the United States in a wide range of medical specialties including surgery, anesthesiology, sports medicine, geriatrics, and emergency medicine. DOs also serve as healthcare policy leaders at the local, state, and national levels. In addition, an increasing emphasis on biomedical research at several of the osteopathic colleges has expanded opportunities for DOs interested in pursuing careers in medical research. knowledge, skills, tools, and technology available in modern medicine, with the added benefits of a holistic philosophy and a system of hands-on diagnosis and treatment known as osteopathic manipulative medicine (OMM). Doctors of osteopathic medicine (DOs) emphasizes helping each person achieve a high level of wellness by focusing on health promotion and disease prevention.